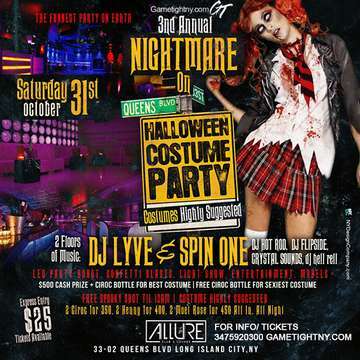 ALLURE HALLOWEEN PARTY – LONG ISLAND CITY QUEENS NYC - HOTTEST HALLOWEEN QUEENS PARTY NYC WITH THE HOTTEST COSTUMES! NIGHTMARE ON QUEENS BLVD! CASH PRIZE FOR BEST COSTUME! HALLOWEEN COSTUME PARTY! 1 DAY - 1 EXCLUSIVE EVENT! MUSIC BY NYC HOTTEST DJS DJ SPINONE & DJ LYVE & MORE & AT CLUB ALLURE NYC IN QUEENS! HALLOWEEN IN QUEENS NYC PARTY ! TICKET EVENT 21 & OVER! HALLOWEEN PARTY @ALLURE IN LONG ISLAND CITY QUEENS, NY! CAPACITY EXPECTED! BUY YOUR TICKETS NOW FOR JUST 25$! EARLY BIRD SPECIAL! ENTRY TO BOTH FLOORS TO ENJOY LED ROBOT, MODELS, CONFETTI BLAST, LIGHT SHOW & MORE! 1ST - 500$ CASH PRIZE + CIROC BOTTLE FOR THE BEST CONSTUME! 2ND - CIROC BOTTLE FOR THE SEXIEST COSTUME! Allure Queens NYC Halloween Dress Code: Its Halloween – be creative! Costume is HIGHLY RECOMMENDED! Club Allure NYC Halloween Bottle Packages: Bottle Prices available by request. 2 Cirocs for 350$, 2 Hennessy for 400$, 2 Moet Rose for 450$ all in all night! RECAP OF LAST YEAR AT ALLURE NYC!